“We ran her two weeks ago on Florida-bred Day at Tampa and turning for home, she looked like she was going to win that race. She moves well on the dirt but when she gets tired, she starts going more up than across. Mark saw that and thought we should sprint on the grass,” said Casse assistant Jamie Begg. “It wasn't our plan to go to the front coming in, but the way she broke, I just took advantage and went to the lead. She responded very well. At the quarter-pole, when I got at her, she responded and was there. I felt good we were going to hit the wire first,” said Franco. 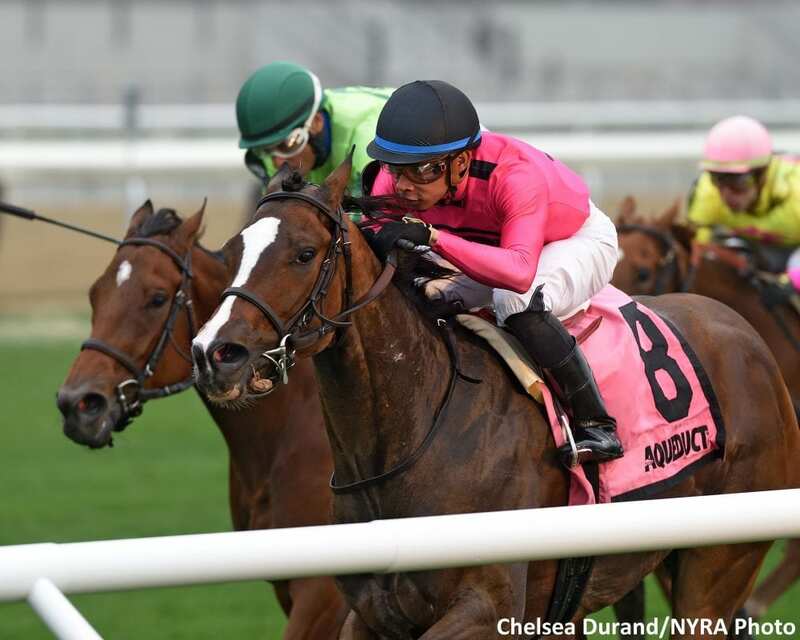 This entry was posted in Racing and tagged aqueduct, Aqueduct Racetrack, eyeinthesky, gary barber, Horse Racing, manny franco, Mark Casse, mizdirection, mizdirection stakes, sky mesa by NYRA Press Office. Bookmark the permalink.